Extremely cool mixed TV-Dramas trailer with Benedict reciting Shakespeare in the voice-over. Excellent alternative version of Sherlock's return. John? Do you want to come to the crime scene? It doesn’t have to be a murder. Amazing Fourtoedcreed had a brilliant idea and I nagged her to give it to me. Alas, she did. This is EXACTLY what I thought in that moment! What do we know about Sherlock’s Mary Morstan? Warning: contains plot details for The Empty Hearse, The Sign Of Three and potentially spoiler-y speculation for His Last Vow (which we haven't seen yet). Something bad is going to happen in Sherlock. How could it not? The Sign Of Three was so cockle-warming an outing for Holmes and Watson, with such a cheering resolution (a baby! a disco! so many declarations of love! ), that it had to be setting us up for a fall. A figurative one, this time. Sherlock’s indestructibility established, the ‘something bad’ dangles Damoclean over other heads than his. There’s John of course, Mycroft, Molly, Lestrade, Mrs Hudson and the Woman, all of whom mean something to us and our hero. Another character though, one whose arrival could have signalled disruption and resentment but whose warmth, humour and winning portrayal by Amanda Abbington meant she ruffled not a feather, feels less safe. We know so little about Mary Elizabeth Watson (née Morstan), a character imported from canon who clicked instantly and perfectly into Sherlock’s mechanics. If an axe is about to fall on the head of one of Holmes’ inner circle, first it’ll have to slice through the question mark hovering over Mary’s. If either, is she victim or trap? She’s a clever, romantic, short-sighted, size 12, cat-loving, disillusioned Lib Dem-voting part-time nurse and only child who reads the Guardian, has a secret tattoo and an appendix scar, bakes her own bread and is both a linguist and a liar. These all being deductions of Sherlock’s, we haven’t been yet privy to their proof (cleverness aside). How often, though, is the man wrong? How Holmes ascertained the existence of both tattoo and appendix scar on a fully dressed woman is a poser, but no more so than how he deduced her political disillusionment and lack of siblings. Anyone fancy a go at reverse-engineering those conclusions? The most intriguing of these text-on-screen deductions has to be “liar”. We’ve seen Mary capable of light subterfuge with the imaginary ‘Beth’ code word and separately manipulating John and Sherlock to pair up on a case in The Sign Of Three. About what else though, and to whom, has Mary lied? The tie-in blog that runs alongside Sherlock has gone to the trouble of creating fictional comments underneath John H Watson’s crime-solving posts. Mary’s first appearance in the universe of the BBC show came in these very comments. On the in-show date of the 20th of April, Mary replied to John’s comment that he just has to “keep going” during his grief with the reassuring words “And you will x”, quickly followed by “Let’s go for a drink later”. John’s as-yet unseen sister Harry, immediately replied, “Who’s Mary???”. From “Let’s go for a drink” to a marriage proposal in under six months is fast work by most people’s standards (though, it should be said, the pair took it slowly in comparison with Watson’s proposal in the Conan Doyle story that introduced Mary, The Sign Of Four). John thinks so, Mary agrees, Sherlock, with the line “Mary, when I say you deserve this man, it is the highest compliment of which I am capable” even allows that Mary Morstan is good for John, and the fans concur. Amanda Abbington’s Mary is warm, funny, clever and very welcome addition to Sherlock’s gang. If there’s any justice in the fictional world, come the close of His Last Vow, none of that will have changed. Whatever role Mary plays in the series three finale, pray that her essential goodness or love of John isn’t called into question. She may have secrets (more on that below), but we don’t want this version of Mary to go anywhere. In the course of solving The Sign Of Four, Conan Doyle’s Holmes revealed to Mary that her missing father was in fact dead, technically making her an orphan (for more on adult orphans, see The IT Crowd’s Roy in Italian For Beginners). When and in what circumstances did Sherlock’s Mary lose her parents? Did she ever know them? Who brought her up? Nursing and bread-baking aren’t Mary’s only skills, she’s also shown a keen knack for distinguishing lies from truth, and an insight into human nature (about which Sherlock, as it’s been established, knows precisely nil). As well as intuiting that Sherlock’s plea to Major Sholto had worked and there was no need for John to break down his door in The Sign Of Three, Mary also told Holmes “I’m not John, I can tell when you’re fibbing”, a talent that could yet prove key to the events of His Last Vow. “I’ve never made a vow in my life and after tonight I never will again, so here in front of you all, my first and last vow. Mary and John, whatever it takes, whatever happens, from now on I swear I will always be there, always, for all three of you.” With those words Sherlock Holmes, human Clear Blue stick, announced that John and Mary were about to become parents, and to a real baby instead of a high-cheekboned high-functioning sociopath this time. Sherlock leaps forward in time as suits the story, so how pregnant Mary will be in His Last Vow, or indeed, whether she’ll have had the baby by then, is all still to know. “Save souls now, John or James Watson…” began the text message that Mary quickly identified not as bible spam, but “a skip code” in The Empty Hearse, sending her off to Baker Street to make Sherlock Holmes drop his chips. The speed of Mary’s code-breaking fits with Sherlock’s deductions of her cleverness and linguistic skills (she recalled Major Sholto’s room number before Sherlock did in The Sign Of Three, too), but perhaps the more interesting question is why the text message was sent to her, and not to Sherlock? After all, John was kidnapped from outside 221B Baker Street, not from his own house or surgery. The taunting messages continued to arrive on Mary’s phone, but were soon addressed to Sherlock, meaning that the person responsible for the kidnap was watching the rescue attempt. This one is indebted to the commenters who pointed out a detail from The Sign Of Three that passed me entirely by on first viewing: the wedding telegrams. A punch line in themselves for forcing Sherlock Holmes to suffer the indignity of reading aloud the words “big squishy cuddles”, the telegrams appeared to contain an allusion to the villain we’re expecting to meet in His Last Vow, the aforementioned Magnussen. If you’re up for a quick re-watch, start iPlayer at around 19:40 in the episode and watch Mary’s reaction as Sherlock reads out the telegram from “Cam”. See it? Mary is visibly perturbed by the message, which seems innocuous enough (“Mary, lots of love poppet. Oodles of love and heaps of good wishes from Cam. Wish your family could have seen this”). Anyone noting her momentary distress on hearing the name, including John, can tell themselves it’s just an emotional day, but what if - as canny commenters have suggested – Cam is in fact, C.A.M, or Charles Augustus Magnussen? What hold might the legendary blackmailer have over Mary? 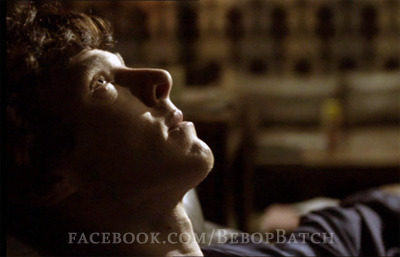 We await His Last Vow to find out. His Last Vow airs on BBC One on Sunday the 12th of January at 8.30pm. Read our spoiler-filled review of The Sign Of Three, here. Michael Fassbender, James McAvoy, Tom Hiddleston & Benedict Cumberbatch as Uni flatmates. Everything from Blasphemy Chowderpants to Rinkydink Curdlesnoot. The Benedict Cumberbatch Name Generator exists and it is GLORIOUS. Each time you click the button, a brand new hilarious nickname for the Sherlock star appears. The Internet thanks you, WandaVentham, for your contribution to humanity. 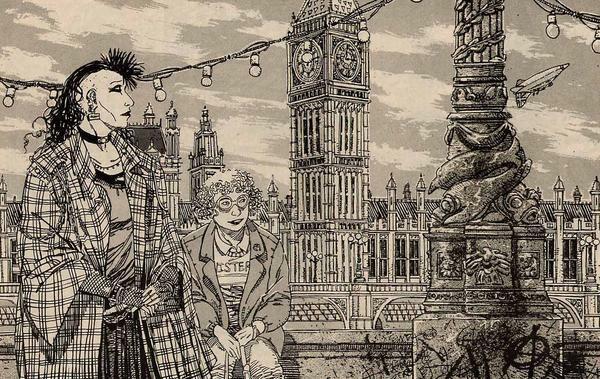 bakerstreetbabes: Honour Among Punks: Sherlock Holmes like you’ve never seen her before. Did you know there’s a comicbook where Holmes and Watson are both women and it’s set in an alternate-history 1980s where Victorian society continued on throughout the 20th century because World War II never happened? And Holmes (Sharon) is a punk who solves punk crimes that are ignored by the police? And she has an angry punk girlfriend named Sam, who lives with her and nerdy American med-student Watson at 112 Baker Street? It’s almost more from Watson’s point of view than Holmes canon, because Watson-as-narrator is enthusiastic but still mostly a naiive outsider to Sharon and her girlfriend’s standoffish circle of punk acquaintances. Sharon is more of a mystery than canon Holmes, possibly because her closest emotional connection is to Sam rather than to Watson, who fills the role of well-meaning sidekick as Sam becomes more and more embittered about Sharon’s obsession with her work. The mysteries resemble classic Holmes without being direct adaptations (they investigate a forgery ring that’s somehow connected with the London punk scene; Sharon tracks a latter-day Jack The Ripper who preys only on men), and the characters frequent an underground nightclub called Baskerville’s. oh my god, oh my god. this, i need THIS! Fantastic work. Sherlock and John: Their relationship backwards. Now THIS is one I'd like the actors and Moftis to see.